Both sibs have sent photographs recently. Mary has taken several pictures of elephants in a series placed around Singapore. 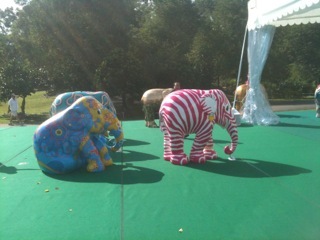 They’re part of a fund-raiser to help Southeast Asian elephants. Mary lives within short walking distance of the Botanical Gardens of Singapore, a delightful collection of Southeast Asian plants placed on large grounds. In fact, she used to work there when her university had its campus on the grounds. The fund-raiser reminded me of the Charles Schultz cartoon characters St. Paul had up a few years back. Singapore is an unusual place, a city-state like days of yore, think Athens, Sparta, Corinth, Rome, Venice. It refers to itself as the air-conditioned nation. Mary refers to it as Asia-lite. I enjoyed my visit there a great deal. 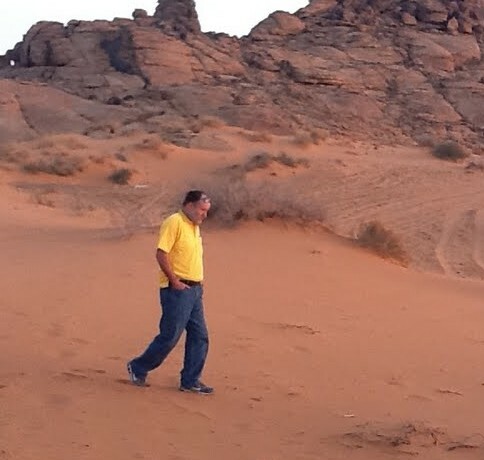 Mark, on the other hand, is in a much less humid environment, Saudi Arabia. He is in his fourth month teaching English in Ha’il, a former caravan serai on the pilgrimage route to Mecca. It sits in the northern third of the Arabian Peninsula, near the center and has some elevation, about 3,000 feet. He has settled in there, having taken trips into the desert three times over the last couple of months. The first time he went dune bashing in motorized vehicles. The second time he visited a camel breeding operation run by a student, black camels, and in his most recent foray wandered the desert where this photography was taken. That puts me in the heart of the North American continent, Mary at the tip end of the Malaysian Peninsula, near Indonesia and Mark in the sands of storied Arabia. That must be about a third of the way around the world to each sibling.